The difference between port and sherry has a lot to do with their origins. Simply stated, one can say that their origins create all the differences. The southern regions of Spain produced sherry, while port was introduced from Portugal. Other countries now make a port wine, but wine connoisseurs consider a real port to be made in Portugal. Otherwise it is just a rich, fortified wine. Port can be produced from as many as eighty types of grapes, but ultimately, there are only five that are really considered to be the heart of port. Sherry is only considered to be sherry if it comes from regionally select areas of Spain, although there is a California sherry. There are only three varieties of approved grapes for the traditional making of sherry. During the process of fermentation, the port wine is not allowed to complete its transition into alcohol. This is why it is a sweeter tasting wine, as there are some sugars that have not transitioned. Sherry is taken all the way through the fermentation process. Sherry has a very unique process by which it is aged. Known as the Solera system, which is a very complex and delicate layering system that extracts the wine from the oldest layers, creates a very unique and strong, but delightful aroma and taste. While each is a fortified wine, there is a difference in taste that is quite discernable. Port tends to be sweeter, and in fact can be blended to be a sweet, almost syrup-like wine. Sherry is bolder, and doesn’t retain the same pungency that port drinkers tend to prefer. Most port wines are sold around the world as non-vintage wines. This does not mean that they are lacking in flavor, or have not been through the regimented process. Vintage ports are dedicated only to those particular harvest years that have yielded some sort of fantastically exceptional harvest. This preserves the integrity of the vintage port wine. 1. Sherry comes from the southern regions of Spain. 2. Port only comes from Portugal. 3. Port is made from any of eighty grape varieties. 4. Sherry is made from only three grape varieties. 5. Port fermentation is interrupted in order to retain sugars and sweetness. 6. Sherry continues the fermentation process through to the end. 7. The aging process for Sherry is very specific and complex. 8. Port is a sweeter wine. 9. Port wines are sold on a very limited basis, as vintage blends. Noa A. "Difference Between Port and Sherry." DifferenceBetween.net. 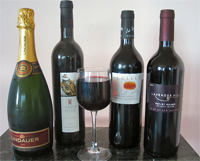 March 6, 2010 < http://www.differencebetween.net/object/comparisons-of-food-items/difference-between-port-and-sherry/ >.